"I finally get to wear the uniform of a high school student! Look, isn't it beautiful?" 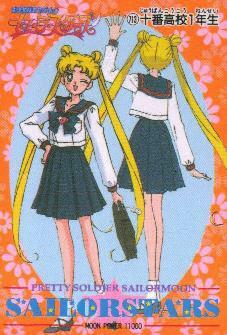 Although Usagi is often clumsy, lazy, a crybaby, and becomes jealous easily, she is also sweet, loving, loyal, funny, and she would do anything to help a friend. Her nickname (meatball head) in Japanese is "odango atama". That is literally "dumpling head." The quote is taken from the first episode of Sailor Stars. In the Manga, it is said that the "future Sailor Moon" will also become Sailor Cosmos. (I don't know if that means Usagi or Chibiusa, since she's Sailor Moon in the future). Sailor Cosmos is "the future Sailor Moon's ultimate form." However it is also said that Sailor Cosmos is "no match for the final courage and strength of Eternal Sailor Moon."